SPECTRUM SOFTTECH SOLUTIONS (P) LTD. was started in 1997 to provide staffing services in USA. 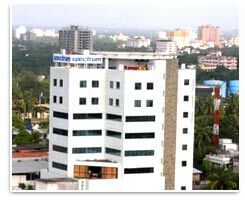 In 1998 we moved to Ernakulam and also started a Software Development division. The company was granted a 100% Export Oriented Unit status under Cochin Export Processing Zone (CEPZ) and became the first such company to operate outside CEPZ. In 1999, we became the first ISP in the state to have opened the VSNL's International Gateway situated at Kakkanad. The Medical Analysis Division was started in March 2000 with a strategic tie-up with M/s SpectraMedi, New York. We opened a branch office at Trivandrum in 2002 and another one in Kollam in 2004. Medical Analysis Training Program was also started in 2002. We bagged the Export Excellence Award for 2003-2004 amongst the SEZ and EOU Units in Kerala in the Electronic and Software Sector. In July 2006, we became the first Private Sector IT Park in Kerala. With the state-of-the art building of 55,000 sq. ft. and more than 400 employees, Spectrum is a leading Medical Analysis provider, catering directly to prestigious multi-specialty hospitals in US. Being in IT field since 1997, Spectrum could provide reliable, top-of-the-line solutions with the shortest possible turn-around time. Apart from our technological supremacy, a reputed team of Medical Analysts in India and a quality-monitoring panel including Board-certified physician in US, form the formidable winning edge of Spectrum. The thrive to succeed and the dedicated employee strength has made Spectrum climb the ladder of success in such a short span of time. • Application and Web Development – Mobile 2005, Dot Net, CGI Perl, PHP and websites. • Remote System Administration - Windows and Linux Systems, Database and Email Servers. • Facility based Internet services - Co-location of Web and email servers of other parties, hosting websites, Internet server and server space rental, group emails and more. © 2018 www.spectrum.co.in All Rights Reserved.